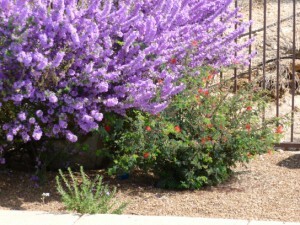 Leucophyllum frutescens, Texas sage, Barometer bush, Purple sage, Sliverleaf. What ever you call it, this is one of our favorite Xeriscape plants. A star in our lineup of Texas Tough Plants. As a native to the Southwest a solid performer you can count on for minimal care and I think, they perform best with little to no attention. Definitely a plant for full sun, they tolerate our heavy clay soils, but, it won’t tolerate over watering. Hard freezes, ice doesn’t seem to affect most varieties, best of all they love it hot! Use it for screening, not hiding, the plant does not have dense foliage, as a focal point, foreground or background plants. A wildlife friendly plant, and its a nectar source for some of our native butterfly and moth species. The stunning purple flowers create an outstanding show of color and make this plant worth the investment in garden space. Once established, the plant survives and doesn’t need supplemental irrigation, under most conditions. 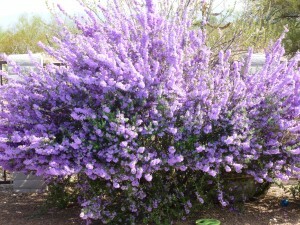 What’s not to like about this plant, no thorns, almost no litter, low maintenance, an attractive plant for your landscape. Pruning: Prune plants to keep compact. Recommended planting for most shrubs and trees is during the dormant period of fall and winter. IF planting, don’t forget the first year needs regular deep watering for positive root establishment. Once the plant is established, no fertilization or watering. Cultivated cenizos tend to become leggier with fewer blooms than in nature; tip prune to increase density. Maintenance: Leaving with a more natural look, prune-to-shape or to shear? Doesn’t really seem to matter how they’re pruned, it doesn’t affect the flower production. The continues to periodically yield an incredible show of purple flowers, no matter what pruning is done. But, they will grow thin and tall over time, have a wild look and not as pretty when they don’t bloom. Pruning late in the spring will remove the bud wood that is necessary for blooms. Shearing: The plant can be sheared regularly, and will perform as a hedge. The shearing will reduce the number of blossoms, and can make the shrubs very thin internally. I prefer a more natural look for the plant, but, selective pruning is time consuming and after working with this plant, it’s a matter of personal preference. GO NATIVE, YEAH BABY! But, we often find plants overgrown for the area they’re planted in and in need of a good, hard prune. In my opinion, at some point the plant is just going to be leggy and thin. I prefer to keep it pruned to a compact size, and in our experience is it a better plant for it. With hard pruning the bare stems are ugly, but, then the new growth appears and all if forgiven.